Removal of calculus (tartar): Calculus is hardened plaque that has been left on the tooth for some time and is now firmly attached to the tooth surface. Calculus forms above and below the gum line and can only be removed by a dental hygienist using their special dental instruments. Removal of plaque: Plaque is a sticky, whitish film that forms on the teeth. It is caused by saliva, living bacteria and food debris found in the mouth. The bacteria produces toxins which cause our gums to become inflamed. This inflammation is the start of periodontal disease! 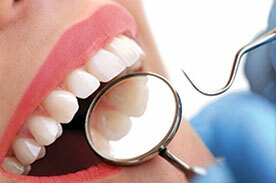 Teeth polishing: Remove stain and plaque that is not removed during tooth brushing and scaling. Examination of diagnostic x-rays (radiographs): Essential for detection of decay, tumors, cysts and bone loss. X-rays also help determine tooth and root positions. Oral cancer screenings: Check the face, neck, lips, tongue, throat, tissues and gums for any signs of oral cancer.